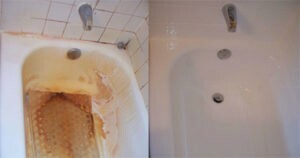 Bathtub Refinishing and Chip Repair - Family Owned and Operated! 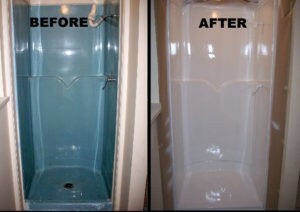 Dallas/Fort Worth's Oldest Family Owned-and-Operated Bathtub Refinishing and Chip Repair Company - Established in 1980! Welcome Back to Sharp Refinishing! 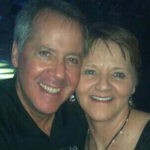 We are Jim and Debbie Sharp, the husband-and-wife team of Sharp Refinishing. Our small, family owned-and-operated bathtub refinishing and chip repair company offices out of Colleyville, Texas and has been serving the bathtub refinishing and chip repair needs of the DFW metroplex since 1980. One of the things that makes us different from other refinishing companies is that we are not a franchise. We have a vested interest in our business, and since our last name - SHARP - is also part of our company name, we put it on the line day in and day out. We refinish nearly every day of the week, all year long, and have for almost 4 decades. 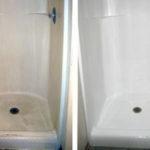 If you did a web search for Bathtub Refinishing Near Me, and you live in the Dallas Fort Worth area or one of its surrounding cities like Arlington, Bedford, Benbrook, Carrollton, Colleyville, Coppell, Denton, Euless, Farmers Branch, Flower Mound, Frisco, Grand Prairie, Grapevine, Haltom City, Highland Park, Highland Village, Hurst, Irving, Keller, Lewisville, Mansfield, North Richland Hills, Plano, Richardson, Richland Hills, Roanoke, Saginaw, Southlake, Trophy Club, University Park, or Watauga, that's how you found us. We're nearby and ready to serve your bathtub refinishing and chip repair needs! Although most of our work is residential and performed on-site in homes, we also do a fair amount of commercial work. More than likely you have found our site through Angie's List or a Google search. As consumers ourselves, we know how daunting it can be to try to choose a service company of any kind just based on a website, so to help set your mind at ease, please take the time to read a few of our testimonials, then call 817.305.0300 or email Debbie@SharpRefinishing.com to talk about your specific refinishing needs. We personally answer all phone calls, emails, and chat sessions, and look forward to serving you! 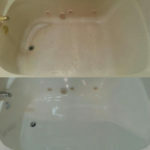 Bathtub refinishing is also known as bathtub resurfacing, bathtub re-glazing, bathtub re-enameling, and bathtub refurbishing. 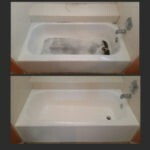 No matter the terms used, bathtub refinishing is a "sprayed-on" process that can make a worn, damaged bathtub look like new again. This like-new appearance cannot be achieved with Do-It-Yourself products. Only a professional refinisher has access to the high-tech, durable coatings that are required to give a bathtub its shiny new appearance. More importantly, only a seasoned, professional refinisher has the tools and skill to apply the surface correctly the first time, every time. Now look at the categories below to choose the FIXTURE or SURFACE you want repaired or refinished. You'll find before and after pictures, as well as pricing for each fixture and surface! Bathtubs fall into four categories: porcelain enameled over steel or cast iron, fiberglass, acrylic, and cultured marble. In addition to that, bathtubs also vary by size and shape. Porcelain, fiberglass, and acrylic bathtubs are usually 5' rectangles, but can be larger. Fiberglass tubs can even be part of a one-piece wall unit. Cultured marble bathtubs are always oversized and may be jetted. Generally, countertops are found in the kitchen and the bathroom. Bathroom countertops are usually made of tile or cultured marble. Kitchen countertops are usually made of formica, butcher block, or tile. 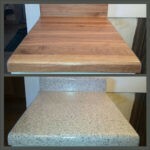 Because countertops get so much use and abuse, we exclusively use a MultiSpec finish - not a solid color - to refinish them. This finish hides a myriad of flaws, and is very durable. Shower floors get a lot more wear than the walls, so if your shower walls still look good, but the floor you stand on doesn't, we can refinish just the shower floor without having to refinish the shower walls, as long as the walls and the floor are two separate pieces. 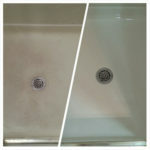 We do not refinish showers floors that are tiled, because shower pans hold moisture that can work its way through the grout lines, causing the surface to peel. Showers can be any size or shape, but generally measure around 70-120 square feet. No matter what type of surface a shower is made of, whether cultured marble, fiberglass, acrylic, or tile, one of the best ways to upgrade and update the look of your bathroom is to have the shower refinished. You can probably buy a new porcelain bathroom or kitchen sink for less than the cost of refinishing, so if your sink is a "drop-in" that can easily be removed from the top, we recommend replacing it instead of having it refinished. However, if your sink is an "undermount" set in granite or tile, refinishing will definitely be less expensive than tearing out the countertop just to fix the sink. We've been repairing chips, nicks, cuts, holes, burns, and cracks in bathtubs and sinks for homebuilders and homeowners across the Dallas/Fort Worth metroplex for many years. From hammers dropping into tubs, to soap dishes and towel bars falling off the wall, chips can happen in homes under construction, in homes just built, and in homes lived in for years. That's what chip repair is for! Acrylic bathtubs have a smooth finish, offer good heat retention, and are non-porous. This type of material will stay glossy and stand up to frequent use. The down side is that this type of finish is quite soft and can scratch easily. 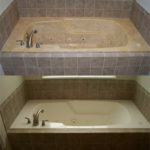 Acrylic bathtubs have little reinforcement and can feel flimsy and less stable when standing. Over time, it is common for the bottoms to develop stress cracks. Cultured Marble is a man-made material (a mixture of crushed limestone and resin covered with a gelcoat) that typically has a "swirly, speckled, or veiny" look to the surface. Tubs can be jetted or non-jetted. Cultured Marble bathtubs come in various sizes, shapes, colors, and style options. They also have a high-gloss finish and offer durability and resistance to stains, chipping, and abrasion. Fiberglass is a type of resin material that is sprayed into the shape of a bathtub. It is lightweight and inexpensive, but it also has a low shine and typically does not have a smooth surface. Fiberglass material is porous in nature, which means it has a tendency to absorb water. In addition to that, the surface is brittle and has a lot of flex to it, which makes it prone to stress cracks. Back in the day, before granite countertops became so popular, most kitchen countertops were made of formica, which is a hard, durable, heat-resistant plastic laminate. 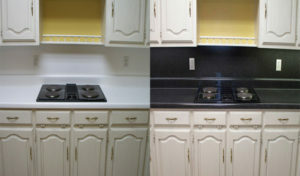 Refinishing countertops in a MultiSpec finish (vs. replacement) will give them the appearance of granite without the high price tag and messy tear-out. The base for a porcelain enameled tub or sink is made of either steel or cast iron. The porcelain finish is baked on at the factory during the manufacturing process. Cast iron tubs are deeper and wider than steel tubs, and are generally found in homes built before the 1970s. Steel tubs are the type builders typically install in today's homes. 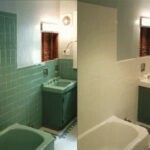 There are typically two places in a home where tile is installed - the kitchen and the bathroom. In the kitchen, countertops and backsplashes can be made of tile, although this is mostly found in older homes. In the bathroom, you'll find tile on the countertops, the walls surrounding the bathtub, or even the walls of the bathroom itself. 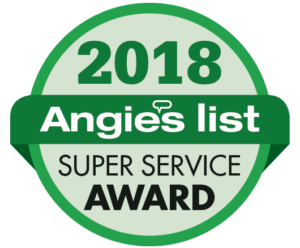 Our service areas extend to most of the Dallas Fort Worth metroplex including Addison, Argyle, Arlington, Bedford, Benbrook, Blue Mound, Carrollton, Cedar Hill, Cockrell Hill, Colleyville, Coppell, Corinth, Dallas, Dalworthington Gardens, Denton, DeSoto, Double Oak, Duncanville, Euless, Farmers Branch, Flower Mound, Fort Worth, Frisco, Garland, Grand Prairie, Grapevine, Haltom City, Haslet, Highland Park, Highland Village, Hurst, Irving, Justin, Keller, Kennedale, Lancaster, Lewisville, Mansfield, Mesquite, North Richland Hills, Northlake, Plano, Richardson, Richland Hills, Roanoke, Saginaw, Southlake, The Colony, Trophy Club, University Park, Watauga, Westlake, and many others. These cities indicate our maximum travel range. Call Debbie at 817.305.0300 if you're unsure whether we travel to your area without an additional travel charge.